Tagetes sp. For general plant information, cultivation and seed specs, see CULTIVATION below. Marigolds are one of the most popular annuals due to their fast growth, bright color and strong, tolerant plants. They lend a splash of color to any garden and make wonderful borders, bedding, or container plants. Easy to grow, they are virtually pest and disease free and are a dependable bloomer even in the heat of summer. The perfect choice for a children's garden. Happiest in full sun and in a well drained soil, they are extremely tolerant of soil types, doing well in sandy and clay soils. Crackerjack Mix - Tagetes erecta - African marigold with large double blooms in shades of yellow and orange. Height 24-36in. 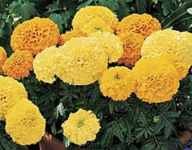 Simba or Lion's Mane - Tagetes erecta - This version of the old 1940's favorite, the Chrysanthemum marigold, has shaggy petals slightly incurving. Gives a whole new look to the marigold bed. Height: 36in. Sweet Cream - Tagetes erecta - Hybrid variety producing 2-1/2 inch double blooms in a rich creamy white. Compact growth habit. Height: 16in. Tall Hedge Mix (Landscaping Mix) - Tagetes erecta - Wonderful collection of the best of the hedge type marigolds producing a complete spectrum of colors running from pale yellow to deep orange on tall strong stems. Perfect summer hedge or border and an excellent cut flower variety - frequent pickings will produce the largest blooms. Height: 36in. Disco Mix - Tagetes patula - Early flowering dwarf variety with brilliant single blooms in yellow, gold and mahogany, some bicolors with contrasting eyes. Long lasting color. Great border or potting plant. Height: 8-10in. 50-60 days. Rich's Dwarf Crested Mix - Tagetes patula - A lovely mix of crested French marigolds, with tufted centers and contrasting collars. Perfect bedding or border plants. Height: 8in. Fireball - Tagetes patula - Crazy mixed up plant with gold orange and mahogany blooms all on the same plant. Wonderful container or bedding plant. Height: 10in. Queen Sophia - Tagetes patula - Compact plants covered with 2-1/2in. double blooms. Color is russet edged in gold. Lovely border plant as it retains its compact habit throughout the season. Height: 10in. Sweet Mace (Mecxican Mint or Spanish Tarragon) - Tagetes lucida - The whole plant a a delicious fragrance of cloves and anise. Glossy smooth deep green leaves and small orange blooms. Great container plant! Height: 16in. Paprika (Signet Marigold) - Tagetes tenufolia (Syn. Tagestes signata) - Native Mexican species forming a broad bushy plant only 1 ft tall. Masses of single daisy maroon blooms with golden edges. Ferny lemon-scented foliage. Height: 8in. Marigolds are decorative annual plants belonging to the Daisy family, Compositae. The two most recognized cultivated types are Tagetes erecta (African or American marigold) and Tagetes patula, called the French marigold (even though the plants of both Afican and French types are native to Mexico and South America) . American marigolds are tall types bearing single or double blooms of white, yellow, orange. French marigolds grow up to 2ft in height and bear single or double blooms in a wide range of colors from pale yellow to dark mahogany, in single colors or bicolors. Both types make excellent border or bedding plants and the French types make lovely container plants. Other notable varieties, though less often cultivated are T. lucida, Anise scented marigold, and T. tennufolia. Marigolds also make excellent winter flowering plants for the greenhouse when adequate light is present. Marigolds thrive in ordinary garden soil in a sunny location. Avoid nitrogen rich soils as the plants will have luxurious foliage, but few blooms and shady locations which will hamper bloom production. Tagetes erecta marigolds have been used to treat indigestion and colic, sores and skin ulcers and rheumatism. A yellow dye is obtained from the flowers. Tagetes patula flowers are used to brew tea, and the leaves as a food flavoring and a digestive aid. Tagetes lucida leaves are dried, ground and used as a tarragon substitute for flavoring foods. The Aztecs used the leaves to flavor chocolati, a cocoa drink. Leaves are still used to brew a popular tea. The plant has been used as an anaesthetic and to treat indigestion, though it also reported to be mildly narcotic. .Tagetes tenufolia blooms are used to flavor foods and for garnishes. The plants secrete substances that have an insecticidal effect against nematodes and some weed grasses, aspragus beetles and bean weavils. Excellent companion plant.